Our February 1st general meeting was a huge success with over 180 people in attendance. 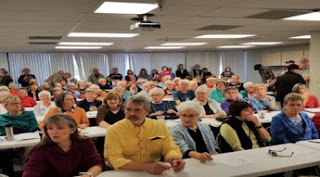 Almost 100 met at the Feb 5th changeishappening! meeting to learn about a4a. Many were motivated to sign up for action groups which are busy meeting and ACTING! Lobbying, writing Letters to the Editor and lots and lots of calling our Members of Congress (MoCs). Some MoC staff members have told us they are totally swamped with calls and visits. We are doing our job! If you have not yet joined an action group, choose one or more from those listed below. Two new action groups formed at the meeting! And there may be more…. We are starting to get information from and about other groups around southern Arizona with similar interests and we will be “stronger together”. Many of us have been overwhelmed with the speed and ferocity of executive orders. It can be exhausting, but remember that this is a marathon, not a sprint, and we can each do only do much. I believe that we are having an impact. Current Priorities: Pending Repeal and Replacement of the ACA, including defunding Planned Parenthood; protecting Medicare and Medicaid/AHCCCS benefits. Current Priorities: Oppose Ms. DeVos’s appointment as Secretary of Education. Support AZ State education funding. · Meeting with Senator Flake's staff on Jan 19 in opposition to Ms. DeVos. Both of these actions would affect employers, child welfare and adoption services, healthcare providers, schools, government officials and businesses as they relate to the LGBTQ community. · Thanks to Linda L. there are handmade signs at the DCSRA HQs office for you to borrow should you care to organize a mini-rally on a GV corner or at the office of a MoC. · Check out our website: http://Alliance4Action.org Thanks to Bill Maki, it is growing more and more useful. In the past few days, he added tabs for each of the action groups. The only tab populated so far is LGBTQ Rights but look for much much more. · Find addresses and phone numbers of our Members of Congress on our Facebook page and on our website.